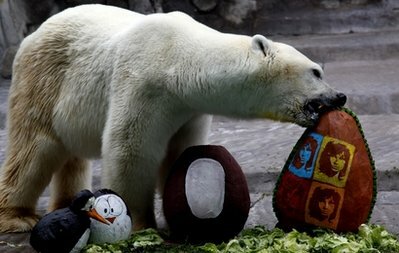 Because for the AP and apparently the Buenos Aires zoo nothing screams Easter like a polar bear eating an Easter Egg decorated with the iconic album cover picturing Jim Morrison. If there were “riders on the storm”, Jesus would calm the story. He did not have to break on through to the other side, but came from the other side to save us. There is no limit to Jesus’ love for use and does not limit it to “love me two times.” You can visit Jim Morrison grave at the Parisian cemetery Pere-Lachaise, Jesus’ tomb remains empty so that we might not be empty but filled with love. Well maybe the reason they picked this egg for the polar bear is that Jesus and Jim Morrison were polar opposites. Happy Easter CJ. BTW, isn’t it time you got rid of your Joyful Lenten Happy Face. Jeff, Please find a little card stacking spiced with very little humor on my part so here “IT” is on this topic. So why are all kinds of traditions so ingrained in Easter Sunday nowadays? And what do they have to do with The Resurrection of Jesus you might ask? Bunnies, eggs, Easter gifts for polar bears and what have you must all in someway stem from pagan roots and still find themselves incorporated into the celebration of Easter nowadays because maybe atheist and all who hurt too much to know that Jesus might really have risen from the dead and if most start believing this stuff like many gods and/or godesses are a waist of time then…..well you know they might start thinking that they are second hand love and find themselves no longer wanting to be separated from the Christian tradition of honoring Jesus Christ who truly Rose from the dead and who really wants U>S (usual sinners) not to be alone at Easter without at least our chocolate bunnies? According to University of Florida’s Center for Children’s Literature and Culture, the origin of the celebration — and the Easter bunny — can be traced back to 13th century, pre-Christian Germany, when people worshiped several gods and goddesses. The Teutonic deity Eostra was the goddess of spring and fertility, and feasts were held in her honor on the Vernal Equinox. NOW! Her symbol was the rabbit because of the animal’s high reproduction rate. The first Easter bunny legend was documented in the 1500s. By 1680, the first story about a rabbit laying eggs and hiding them in a garden was published. These legends were brought to the United States in the 1700s when German immigrants settled in Pennsylvania Dutch country, according to the Center for Children’s Literature and Culture. The tradition of making nests for the rabbit to lay its eggs in soon followed. Go Figure! Eventually, nests became decorated baskets and colorful eggs were swapped for candy, treats and other small gifts. Happy Easter- Christ has risen indeed, Alleluia. What’s with the headless penguin? That’s equally disturbing. Before reading, I thought the bear got ahold of one of Mrs. Shore’s mitres.